Screenshot via FIDEThis is the rematch we’ve all been waiting for. The match consists of 12 regular games (with tiebreaks as needed) and runs through the end of the month. It’s being played in Sochi, Russia. Unlike last year, when the players started with a fairly quick and rather boring draw, this year’s Game 1 was an engrossing example of elite Super-Grandmaster chess (although for the rematch, Anand got to start with the white pieces). It consumed 48 moves, numerous hours, and was a great display of attacking and defending at the highest level. The first moves set up what’s called the “opening” — the critical initial 10-15 moves of the game. Most amateurs and even many professionals open by moving the pawn in front of their king two squares forward. In algebraic chess notation, this is called “e4” and that’s how a player will write it on his or her scoresheet. It’s also known as a “King’s Pawn” game. Anand, a smooth player who can bring powerful, attacking chess to the board seemingly at will, has often played e4 — aggressive players love to play e4 because it achieves a chess fundamental, staking a claim to the center, and supports another fundamental, creating a line for the light-squared bishop to be developed while preparing the white king for castling. Unfortunately, e4 can lead to an opening called the “Berlin Defence,” now often called the “Berlin Wall” because at the Grandmaster level, it gives black a great chance to secure a draw. This was a problem for Anand last year; he couldn’t break through the Berlin Wall in the three games in which it arose, even losing one game as white. The premier GM opening these days that evolves from e4 is the famous Ruy Lopez, or “Spanish Game” (named for the Spanish priest who devised it). It’s been around for centuries — and sadly in 2013 the Berlin Defence took the teeth out of it. 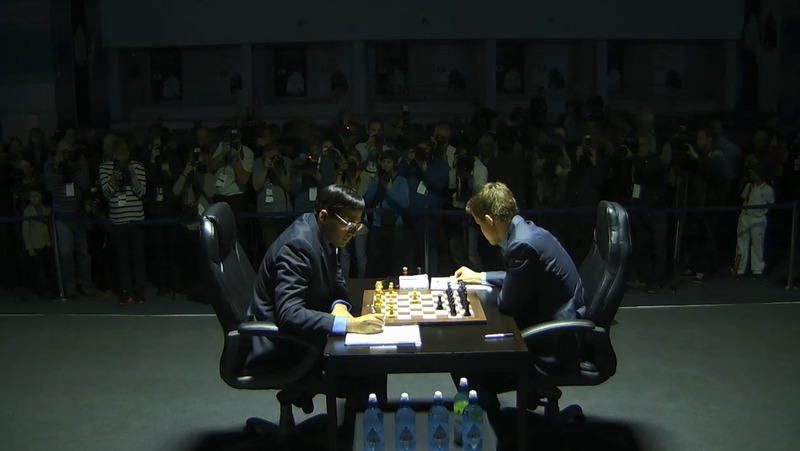 So Anand opened with d4 instead. This is the other popular pawn opening: the pawn in front of the white queen is moved forward two squares, and unsurprisingly when not called “d4” the opening is referred as a “Queen’s Pawn” game. Unlike e4, which claims a piece of the center with an undefended pawn, d4 aims for center control with a pawn that’s defended by its queen from the get-go. Chess.comAnand opened with the move d4. 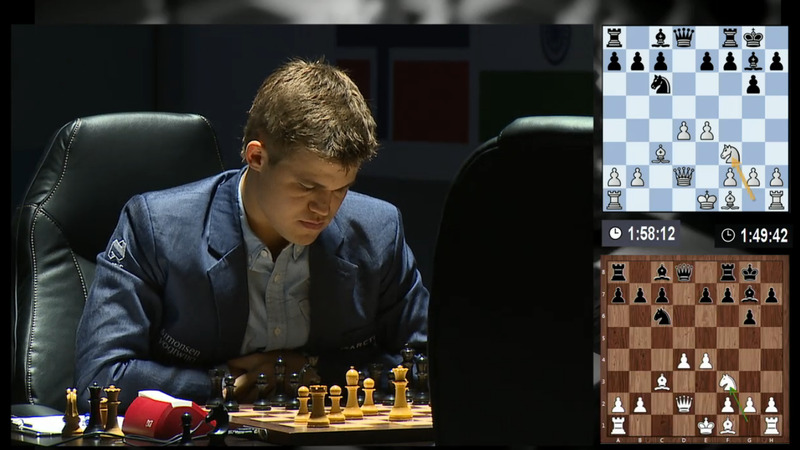 Carlsen responded by moving his knight to the f6 square. The following sequence of moves led to an opening called the “Grunfeld Defence,” named after the early 20th century Grandmaster Ernst Grunfeld of Austria, who popularised it. The Grunfeld has become one of the top replies to d4 in modern GM play. 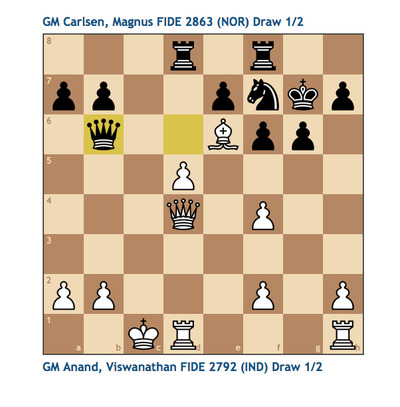 It was supercool to see it rolled out by Carlsen, who isn’t known for playing it all that much — his idea seemed to be to confuse Anand, but as we’ll see, Anand had a trick up his sleeve. It was also cool to see the Grunfeld because the Russian GM Peter Svidler (world #18) is providing commentary for the official WCC webcast (Game 1 is archived here), and he’s a total Grunfeld geek — an expert in the opening. Plus, while I’m very, very far from a master chess player, I play the Grunfeld as black (if I can) pretty much exclusively against d4, so I felt that I could follow along pretty easily for the first 10-15 moves or so. The main idea with the Grunfeld is for black to let white have a lot (but not total) center control but to work later to undermine it. As such, it’s what’s know as a “hypermodern” opening, but as you can see from the diagram above, it doesn’t allow white to build up an utterly imposing center because the pawn comes to d5 (preventing white from playing e4 unopposed) to complete the characteristic opening sequence. 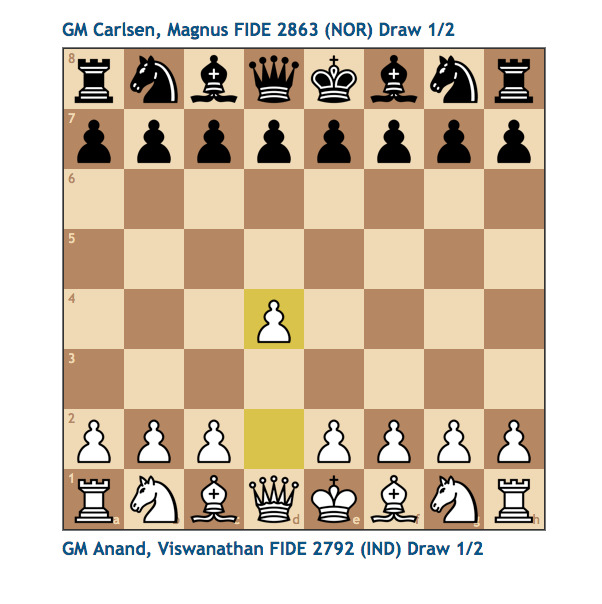 Anand briefly confused Carlsen — or at least made him spend 15 minutes thinking about an obvious move — by countering Carlsen’s Grunfeld with a single offbeat move that proved he knew what Magnus was up to. Susan Polgar, one of the strongest female GMs in the world, in her commentary suggested that Anand, who is comfortable in the Grunfeld, threw Carlsen a curveball to test his preparation. Screenshot via FIDEThe move Nf3 by Anand sent Carlsen into a deep think. 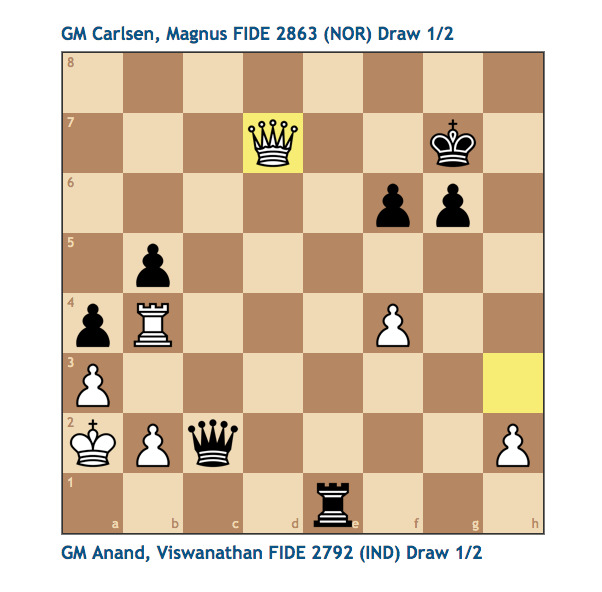 Chess.comWith Qb6, Carlsen offered to trade queens, but Anand said no, playing Qd2. The players had castled on opposite sides of the board, a setup that can lead to some ferocious chess. 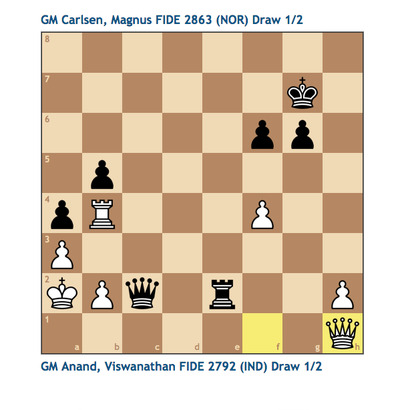 But it didn’t materialise, as Anand was never able to get his pawn on the critical attacking h-file going, although Carlsen did make things interesting when he launched his pawn on the a-file down the board and coordinated his queen and remaining rook. Chess.comThe move Qh1 saved the day for Anand. With Carlsen unable to mount a threat against Anand’s king, the challenger slipped out of an uncomfortable endgame by putting Carlsen into an endless or “perpetual” check — the same position would have been repeated three times, so the players called it a draw. Chess.comCarlsen’s king can’t escape endless checks by white’s queen. 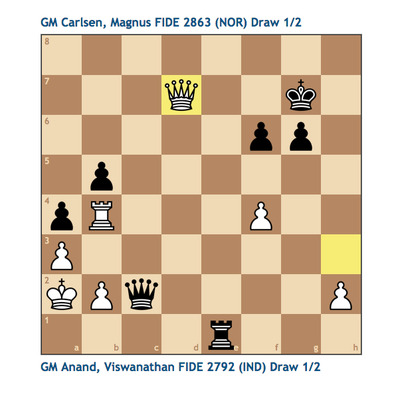 Anand couldn’t get the attack he wanted on the kingside — his h pawn was more often a target than a threat — and Carlsen was aiming for a gruelling endgame, his specialty. Magnus has to feel great because he grabbed a draw as black, was never truly losing and at times looked like he was winning, and made Anand play a long game. Anand didn’t really uncork anything dazzling, only perplexed Carlsen in two or three positions, and looked weak toward the end the first time control. Interestingly, the game ended in a draw by repetition just as Game 1 in 2013 did, but this draw took far, far longer. 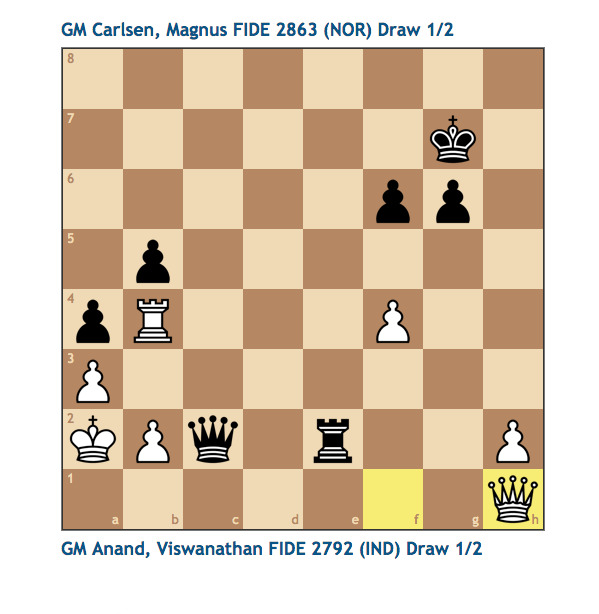 Anand can’t be happy about that — but he has to be stoked that he played great chess when he needed to. My theory about this rematch is that Anand can’t afford to let it go the distance — he crumbled last year after four draws to start the match. He needs to go for wins as white and black. 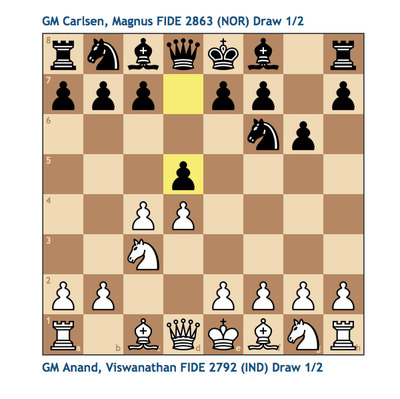 Carlsen has already seen enough after Game 1 to know that he can get a pressure-packed draw with the Grunfeld and always fall back on the Berlin Defence if Anand tries to open with e4 rather than d4. What’s tough about Carlsen is that he’s able, when playing black, to negate white’s first-move advantage and sometimes turn draws into wins after white runs out of gas on what might look like a winning attack and has to craft a draw — which if your goal was to win is the same as admitting defeat! In Sunday’s game, I’ll bet that Carlsen opens with e4 Anand plays c5, which sets up another famous opening called the “Sicilian Defence.” Anand played it once last year, when he had to win or lose his crown (the game was a draw and Carlson took the title). As it turns out, I’ve been looking closely at the Sicilian lately — even though I never play it as black — because my 9-year-old son, who plays scholastic chess, loves it. It can create a very strong winning position for black and stymie white’s efforts to contain some of the wildness and generate his own attack. Why would Carlsen invite this? Because he knows that by refuting an Anand attack, as he did in the Sicilian last year, he can frustrate him that much faster. The “winning” draw in Game 10 last year took 61 moves. 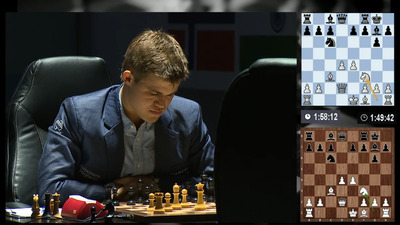 In 2013, the big complaint about the WCC was that, initially, it showed everything that’s supposed to be wrong with Grandmaster chess: now that the players can use computers to analyse positions into the ground, many of the games are boring draws, sometimes even agreed to very early on when it’s clear where play is headed. The vibe is already completely different this year. First, fans got to see Carlsen and Anand play a game that was defined by one of the systems that’s right at the center of GM competition — d4 leading to the Grunfeld is going to produce chess of the highest order, even if there isn’t a ton of fireworks.